Pra Somdej Luang Por Pae, Wat Pikul Tong – Thaan Krut (Garuda Dais) – Made in the Year 2542 BE in the Metta 94 Luang Por Pae edition. 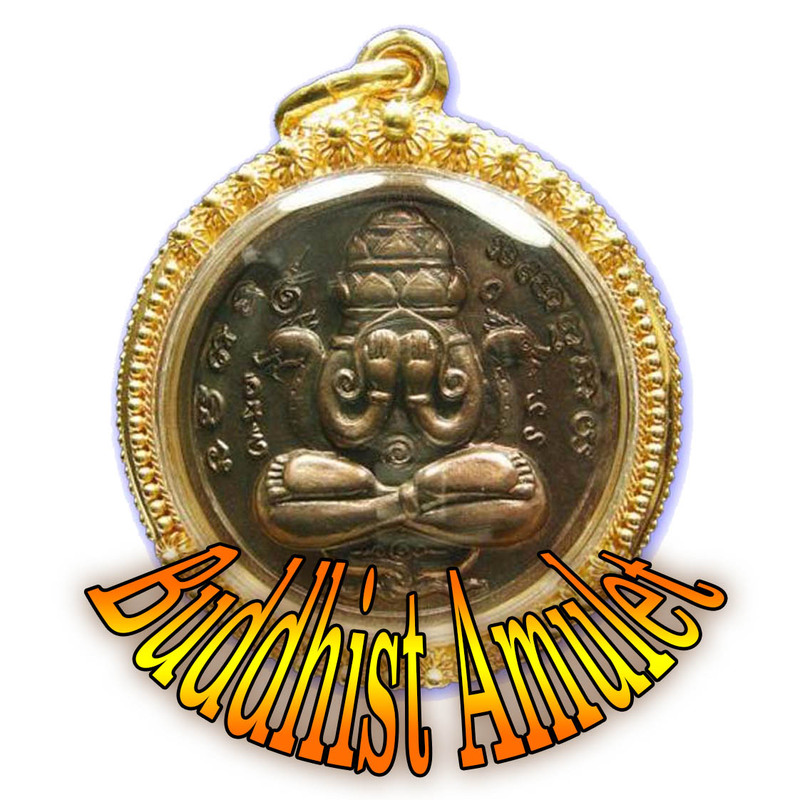 The amulet was made in various versions, all of which, just like most Pim from this master, are now becoming extremely difficult to find many remaining examples of. 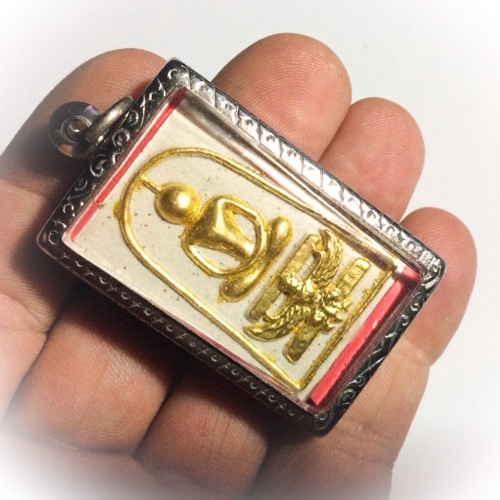 This is perhaps the final time where these amulets may still be found if one searches with great diligence, but otherwise, will appear extremely difficult to find. 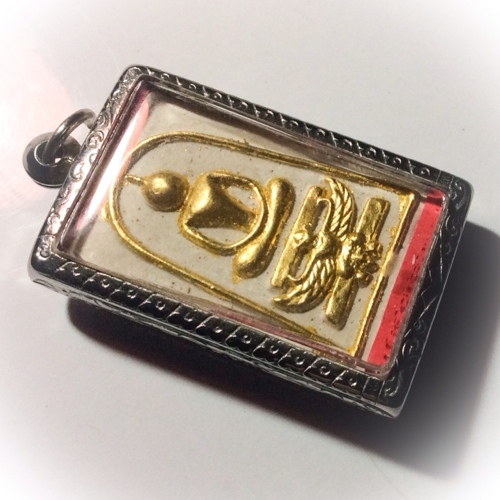 The amulets, have in this Pim, gold painted Buddha image on the front face, seated on a Garuda Dais. 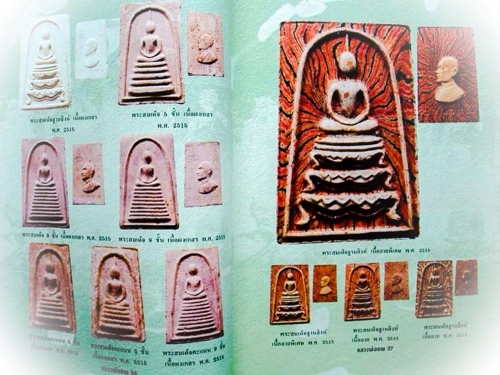 This model measures 4 x 3.8 Cm, which is a ‘Pim Yai, sized Pra Somdej roughly the size of the famous Pim Pra Pratan, which is popular from Wat Rakang Kositaram, Wat Bang Khun Prohm, and from Wat Bovornives. The image of the Buddha sitting upon the Garuda dais, has a swollen chest and feline waist, that is elongated, and is known in Thai language, as ‘Ok Krut’, which means ‘chest of the Garuda’. The head of the border has a very pointed and elongated topknot, which almost pierces the overhead arch. The actual face area is not elongated, rather very round and protuberant, like a spherical dome. This kind of pointed topknot and round face, is known as ‘Siarn Badtr’, which means ‘head like an almsbowl’. This model when given its full title, would hence be called; “Pra Somdej Pae Thaan Krut Hnaa Tong Ok Krut Siarn Badtr”. 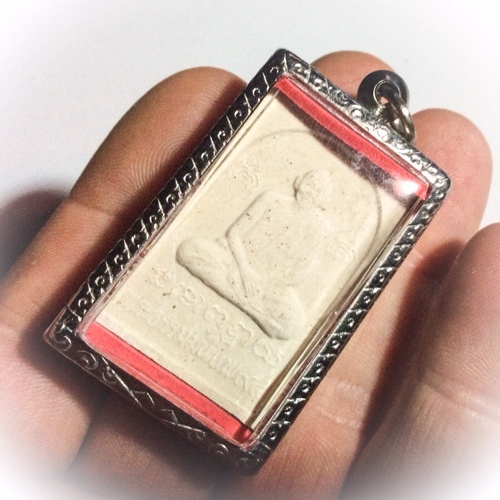 The rear side of the Amulets features some sacred geometry and ancient Khmer Sanskrit inscriptions, of the syllables ‘Na Mo Put Taa Ya’, and an image of the grandmaster Luang Por Pae. 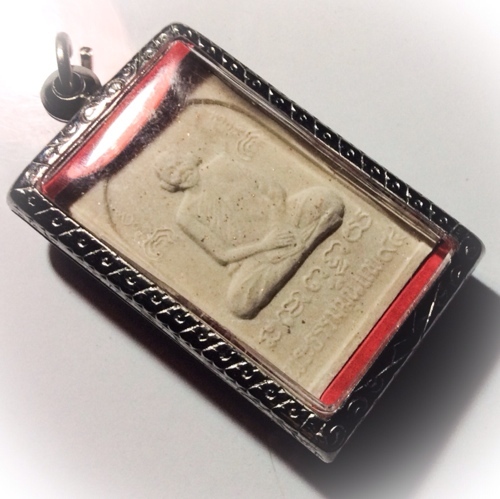 Either side of the grand master, are the famous ‘Yant Putsoorn’ concentrically written Yantra spells, which are present on almost all, if not all authentic amulets from this guru master. 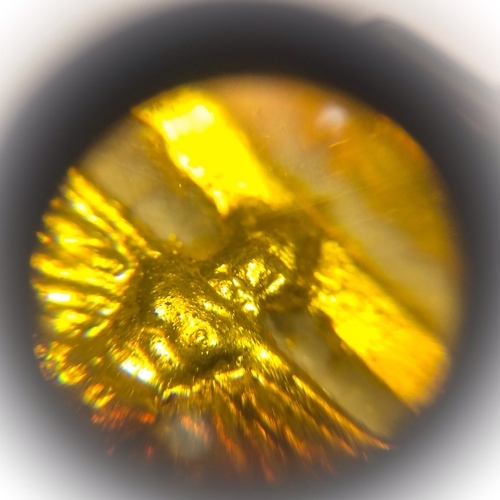 The amulets were made in red, green rainbow, white, black and gold, in white sacred powder, or in rainbow colours with, or without gold leaf, and in this white sacred powder with gold face. Some of the rare editions with Takrut spells inserted into the Muan Sarn Sacred Powders, were also released in varied limited edition numbers. These and almost all of his amulets can be found in many volumes of official documentation which is part of what makes his sacred amulets so popular, because of their ease of authentication when one has good reference images for study. 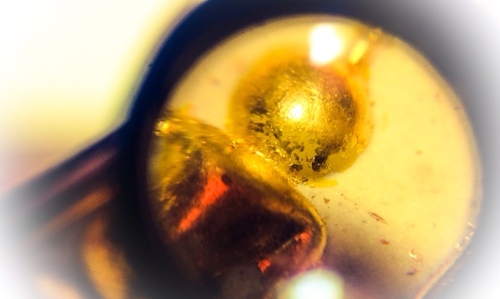 The detail is much finer and ingrained, then it is in fakes. 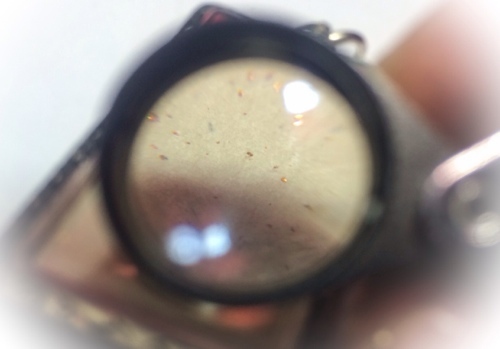 The inserts in the bases of many of the amulets are also had to fake. And in especially the case of the rainbow coloured ones, very few forgeries manage to produce the distinct separation of each coloured line,within the rainbow patterns of his most dense and hard dry sacred Amulets. This has caused a massive depletion of those amulets which could still be found on the market back in those days. 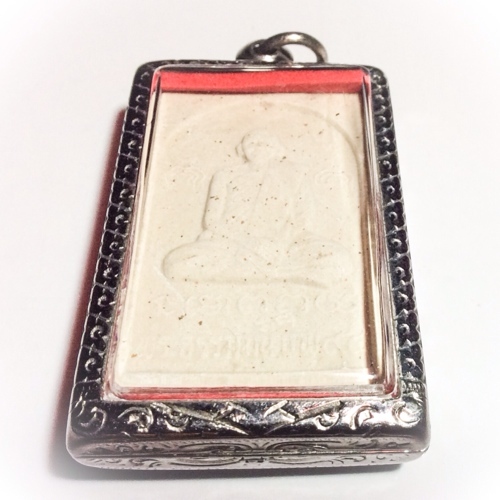 As a result, these amulets have not only attained the grand respect and high spiritual and monetary value that they possess today, but are also now entering the halls of fame of essential rarities, which are immensely hard to find. We predict that by the time our children are grown up, these amulets will be of immensely increased value, and incredibly hard to find one on offer at all, except at an exorbitant price. We for one, are attempting to seek and find any remaining exhibits we can en ounter, and must admit, that the hunt, is not an easy one. 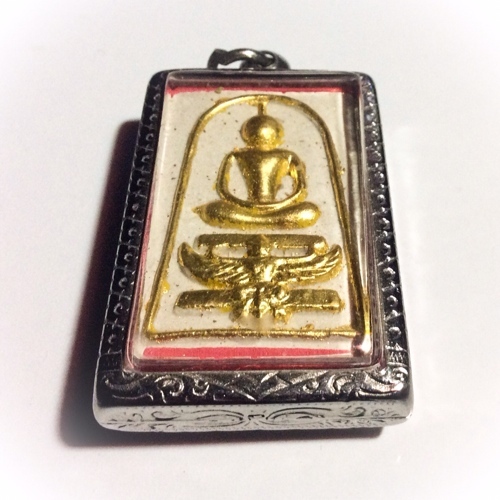 It is not expected to become easier either, so now is the time, to hunt and gather the amulets of Luang Por Pae, before it is too late. These are both on show as personal collection, but for rent (sale), with the attitude, that it is nice to keep, and if they never sell, we won,t ever be bothered about it, because they are fine amulets to have, and we are as happy to keep them, as we are to provide you with the opportunity of owning one. 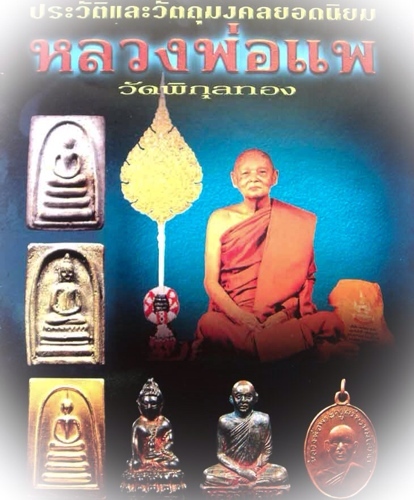 View this in the store; Pra Somdej Luang Por Pae Wat Pikul Tong (Singhburi).